There is a reason why Phoenix is referred to as the scorpion sting capital: more than 45 species of scorpions are found there, with the most common scorpion being the bark scorpion. Unfortunately, this type is also the most venomous and most likely to kill you. This species is the only lethal scorpion in Arizona, according to Scorpion Sweepers. Do not let its small size fool you: although it only measures one- to one-and-a-half-inches long, this sucker can sting you bad. Because it enjoys dark and cool places, its common hiding spots include wood piles, palm trees and decorative bark, causing the majority of bites — 90 percent in fact — on the hands, says the City of Phoenix. If you live in an area teeming with these critters, you are more likely to find them inside your home. According to Banner Health, thirty three percent of scorpion stings occur in the bedroom, twenty four percent in the living room and six percent in the bathroom. The warmer weather tends to lure scorpions out of their hiding, so be especially vigilant when the cooler weather dissipates and the climate really heats up. You will recognize the bark scorpion by its slender, streamlined appearance that is very light beige or almost opaque in color. Symptoms of a scorpion bite include sharp pain at the site, discoloration, swelling that spreads, drooling, nausea, restlessness, incontinence and seizures, warns the City of Phoenix. Treat stings right away with ice and keep the airway clear. Get to a hospital immediately, where you can get an anti-venom to combat symptoms. Scorpions — bark scorpions in particular — are excellent climbers, so look for them on cement basement walls, ceilings and even your shower curtains. You may want to install a scorpion shield to prevent those critters from falling into your baby’s crib. Peel back the layers of your bed and inspect for scorpions before you get into bed at night. Look inside shoes and clothing before putting them on. Remember, they like damp dark places. Keep furniture away from the walls and do not leave damp beach towels laying around in the bathroom or pool area. Keeping these precautions in mind can reduce your chances of a scorpion sting and from becoming yet another statistic. Contact Varsity Termite and Pest Control today. 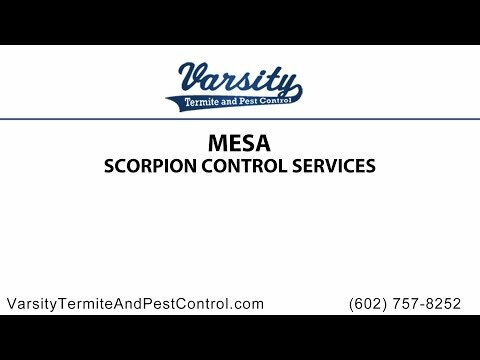 As one of our experienced scorpion exterminators in Mesa will be happy to help you. If you have any questions or concerns regarding scorpions, please ask away! We will provide you with all the information and answers you will need to know. Our company is here to help as we believe that your satisfaction is the most important to us. We want you to be happy, safe, and comfortable in your own home as we help keep all the pests away for you.